Data may not be human but as an android he can attest that he is “Fully Functional” in his ability to be like a human. 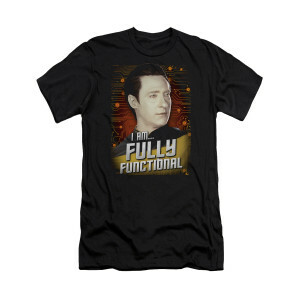 Get the Star Trek The Next Generation Fully Functional T-Shirt and show you’re a fan of the android who is always growing to be more human. Wonderful design, it takes up much of the shirt and what a great way to show your love of TNG. I’m on the petite side but a size small fits just fine.